It’s something of a miracle that Grand Illusion is available to be watched these days. The original print was thought to be destroyed during an Allied air raid in 1942. It was later found in the 1960s then transferred from Germany to Russia to France, with none of them realizing that they had the original negative. It wasn’t until the early 1990s that it was rediscovered, and eventually it made its way to the Criterion Collection. And what luck! The Criterion version is absolutely beautiful. Grand Illusion is set during the First World War, and it follows a group of French soldiers who are held as prisoners of war by the Germans. After two French aviators, Captain de Boeldieu (Pierre Fresnay) and Lieutenant Maréchal (Jean Gabin), are shot down by acclaimed German Rittmeister, von Rauffenstein (Erich von Stroheim), they arrive at the nearest German base. Boeldieu and von Rauffenstein are able to bond over their high social class, making the captivity seem more cordial than anything. After seeing the treatment of prisoners of war in other films, it’s shocking to see just how well the French are treated here. Even Maréchal, a working class man, is offered lunch immediately. Yet even with this hospitality, the Frenchmen are determined to escape the prison. Upon meeting the other POWs, it is learned that they have been working on a secret dirt tunnel below their room. Before they are able to finish, however, everyone is transferred to other camps. De Boeldieu and Maréchal bounce from camp to camp, eventually getting settled into a mountain fortress. It is here where where the two once again encounter von Rauffenstein (still very friendly) and also a prisoner from the old camp, Rosenthal (Marcel Dalio). Even though the fortress is dubbed “inescapable”, the men immediately get to work on developing a plan. One tactic — to get the entire group of prisoners to cause a ruckus by playing wooden flutes — is sheer genius. This act is the most suspenseful of the film, as it focuses more on an actual prison escape, whereas the beginning is more of a social/political commentary. The film has a lot to say in this regard, though it is difficult to understand the class relations without knowing quite a bit about what it was really like back then. Director Jean Renoir fought in World War I himself (Gabin even wears Renoir’s real uniform in the film), and his firsthand experience shows the vast difference between the two wars. The upper class in the first war act cordial with each other regardless of nationality, something unheard of just years later. 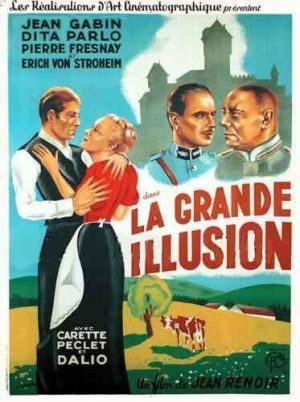 Filmed in 1937, not too long before the beginning of World War II, Grand Illusion is very much a portrait of its time. Given its overall statement and the general uneasiness of the world at this time, it’s easy to see why the Nazi Propaganda Minister Joseph Goebbels declared this “Cinematic Public Enemy No. 1”. The back story surrounding this film is absolutely incredible, and it only enhances the viewing experience today. So wait. From 1940 ish to 1990 ish no one ever saw this film? That is pretty amazing. Also sounds like a good movie (though I’d never heard of it). I’ll check it out. Pretty crazy, isn’t it? I’m happy to spread the word on this French classic. The Criterion disc is well worth seeking out if you get the chance. I love this movie. Perhaps its most enduring feat is the deep focus cinematography, which inspired Orson Welles to famously use the same in Citizen Kane. I read somewhere that Orson Welles named this one of the films he would bring on “the ark” as well. That’s high praise right there. I’ve never even heard of this Eric. That’s cool that Criterion was able to salvage it! I should put this on my to-watch list! It’s a great one, Ruth. Definitely one to see! I have Grand Illusion on my blind spots list for 2014. I’ll read your review, once I’ve seen it. In fact I’m pretty blind to all of Jean Renoir’s body of work 🙂 Rules of The Game is another by Renoir I’m told is worth seeing. This is the only Renoir film I have seen as well. I might have to check out Rules of the Game sometime soon. Great review, Eric. This is on my own watchlist for being a Best Picture nominee. Interesting trivia about its temporarily-lost status… glad it was eventually found again. There are a few Oscar nominees that are essentially lost (one completely lost, and three which are only available in UCLA archives), so it’s nice to know that there’s one that’s actually available to the public. Thanks! 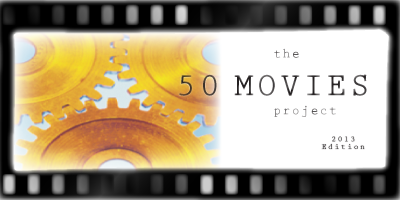 I didn’t realize there were so many lost/rare Oscar-nominated films. Yeah. You’d think that if there were any films that they would have made an effort to preserve…. There are only a handful, but it still seems like a lot just because of what they are. They’re all from the early days, of course. The newest of them was a 1934 nominee. The super-rare ones are The Racket, East Lynne, and The White Parade; the completely-lost-for-now one is The Patriot (1928). TCM apparently aired The Racket a few years ago, but it’s still “only one copy known”. That’s really interesting. Hopefully some day they will turn up in a janitor’s closet (or something) like The Passion of Joan of Arc did in the 1980s.